Many of us have at times had trouble sleeping in the comfort of our own bedrooms, so it’s hard to fathom what it might be like to get sleep on a spacecraft. Those who attended last week’s Inland Northwest Research Symposium at WSU Spokane got a pretty good idea during the keynote lecture presented by scientist Dr. Erin Flynn-Evans. Flynn-Evans—who leads the Fatigue Countermeasures Laboratory at NASA Ames Research Center—painted a vivid picture of the trials and tribulations of sleeping in space, along with solutions being tested as NASA prepares for manned missions to Mars. Many of the sleep issues astronauts experience are the same ones we’ve all endured at some point. There’s acute sleep loss, such as that occasional all-nighter you pull to finish a project on deadline; chronic sleep loss, which involves losing sleep on a regular basis for an extended period of time; sleep inertia, that groggy feeling after you’ve just been woken up from deep sleep; and circadian misalignment, which is when your sleep schedule is out of sync due to shiftwork or jetlag. Due to workload demands and environmental factors associated with space travel, these issues compound in astronauts and can negatively affect their performance and safety. According to the National Sleep Foundation, we need between 7 and 9 hours of sleep per night. Yet, astronauts on US space missions have been getting as little as 5.5 hours of sleep per night on average, which could result in fatigue-related mishaps if not carefully managed. Flynn-Evans recounted the story of Gemini 11’s two astronauts briefly nodding off after mission control gave them a moment of silence to enjoy the view from space of their home area of Houston. They got a good chuckle from it, but the consequences of sleep loss cannot always be laughed off. In another fatigue-related incident, a Russian supply spacecraft collided with the Mir space station while one of the astronauts attempted to manually dock the craft, resulting in significant damage to the space station. “No matter how much you want to stay awake, sleep will eventually take over,” Flynn-Evans said. So how can astronauts cope with the effects of sleep loss at times when getting more sleep is simply not feasible? Caffeine is one way to stay alert. In 2015, an Italian astronaut was the first to brew espresso in space and drink it from a specially designed zero-gravity cup (see video above). It helped to enhance an experience that previously involved drinking pre-prepared coffee from a pouch. Sleep medications have also been used, Flynn-Evans said. However, data she presented showed that even astronauts who take sleep medications are still not getting enough sleep. One thing NASA has done to help astronauts get more sleep is improve the design of sleep stations aboard spacecraft, as research data has shown that factors like noise, lack of privacy, and ambient temperature accounted for some of the sleep loss experienced. Planning ahead for human travel to Mars, NASA is also taking a closer look at misaligned sleep schedules. On earth, daylight helps reset our biological clock when it is out of sync, but astronauts don’t have the benefit of earth-based natural light patterns out in space. To make matters worse, days on Mars last about 40 minutes longer than ours, and the planet’s red-toned light doesn’t work well to reset astronauts’ biological clocks to sync with those longer days. To solve this issue, NASA has been testing the use of blue light boxes to shift astronauts to the Mars day. Finally, Flynn-Evans showed a tablet-based device that uses a mathematical model to make individualized predictions about astronauts’ fatigue levels. She said the device will be used to plan sleep times and schedule complex tasks at times of optimal alertness. 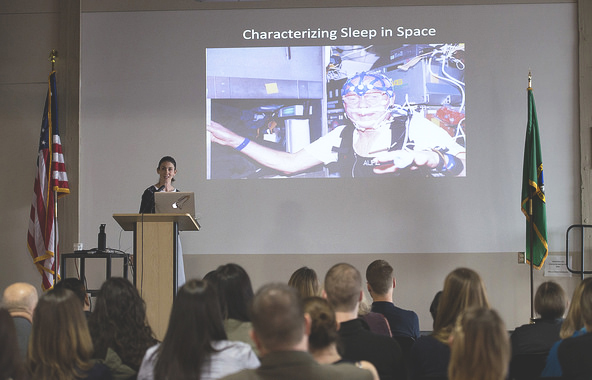 During her visit to WSU Spokane, Flynn-Evans also presented a seminar on sleep loss among commercial airline pilots as part of the Sleep and Performance Research Center Seminar Series. Meanwhile, Sleep and Performance Research Center Director Hans Van Dongen was in Australia working with researchers from NASA and the University of South Australia to examine the effects of sleep loss on team performance in space and on the ground. Are you curious to see how astronauts sleep in space? Watch this short video.